Following a freedom of information request, it was revealed that north Belfast MP Nigel Dodds wrote to Belfast City Hall to claim he had received “numerous objections from local residents” about a plan for new houses at what he described as a “community interface”. He called for the plan to be scrapped. The group that lodged the Freedom of Information request, ‘Participation and the Practice of Rights’, said it was alarming that the DUP MP would act to block housing in an area with “a high level of housing stress”. Separately, a DUP election leaflet called for “local homes for local people” as well as “taking back control of immigration”. Another party representative shared a similar message online about a house daubed with ‘locals only’ graffiti successfully being allocated to a ‘local’ resident. Alliance leader Naomi Long said there was no place for “this kind of dog-whistle racism and sectarianism in our community”. Sinn Fein’s Ciaran Beattie branded the leaflets as “disgraceful”, while SDLP’s Gary McKeown said it was “so shocking that at first I thought it was a hoax”. 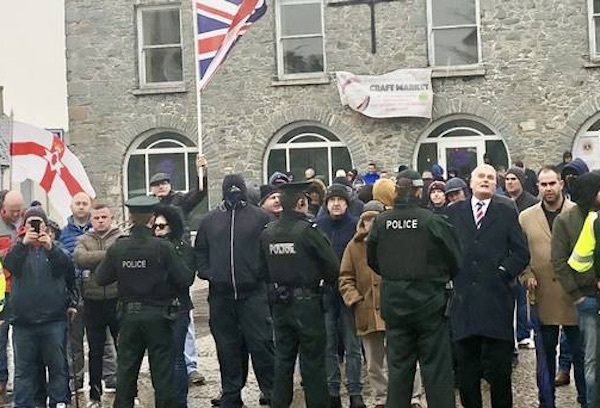 Meanwhile, the DUP’s Jim Wells has been condemned for taking part in a protest with masked loyalists (pictured) during a Sinn Fein rally in Ballynahinch, County Antrim. He described the town as a “unionist town”. Loyalists covered their faces with hoods while shouting “scum” at the Sinn Fein representatives. Sinn Fein MP Chris Hazzard, who addressed the event, accused Mr Wells and other protesters of trying to “shout down” their candidate Marianne Clearly. He said loyalists had come “to shout abuse at Sinn Fein representatives and members of the local community” and its council candidate, Marianne Cleary, had been subjected to a “barrage of sectarian abuse and personal vitriol”. In a separate development, Ireland footballer James McClean is to receive damages from a unionist councillor who bizarrely claimed on a radio programme that he was involved with the Provisional IRA. Mr McClean, who is from Derry, has become the subject of routine sectarian hate and racist taunts over his failure to wear the poppy remembrance symbol in support of the British Army when playing in the English Premier League. He issued defamation proceedings following a sectarian outburst by UUP councillor Chris McGimpsey on BBC Radio Ulster’s Nolan Show in November last year, in which he described Mr McClean as a ‘super Provo’. A barrister for Mr McGimpsey read out a statement in open court this week in which he accepted that “the statement was false and completely inaccurate”.